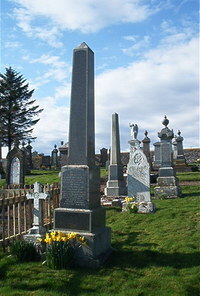 Reverend Hugh Matheson PD Minister of Lybster Free and United Free Churches for 35 years born at Pitintrail Rogart 1st October 1845 died at Lybster 28th May 1922. Son Hugo Matheson lost at sea the result of enemy action 14th November 1940. Wife Sophia Sampson died 22nd June 1942.